Beverly Hills: Sunday, February 19, 2017, 7:00 p.m.
Redondo Beach: Monday, February 20, 2017, 8:00 p.m. Thousand Oaks: Tuesday, February 21, 2017, 8:00 p.m.
Pasadena: Wednesday, February 22, 2017, 8:00 p.m. 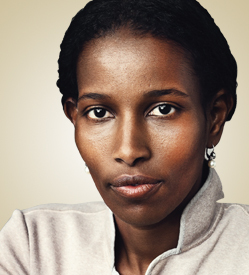 Renowned political leader, national security expert, women’s rights advocate and Islam reformist; Ayaan Hirsi Ali is the four times New York Times bestselling author of Heretic, Infidel, Nomad, and The Caged Virgin. Ayaan is a prominent speaker, debater, and journalist, who was chosen as one of Time magazine’s 100 most influential people in the world, one of the Glamour Heroes and Reader’s Digest’s European of the Year for 2005. In her presentation she will share her journey from a deeply religious Islamic upbringing, elected office in the Netherlands to a post at Harvard. She will make a powerful plea for a Muslim Reformation as the only way to end the horrors of terrorism, sectarian warfare and the repression of women and minorities. She is now a Fellow with the Future of Diplomacy Project at the Belfer Center for Science and International Affairs and The Harvard Kennedy School. She is also a visiting scholar at the American Enterprise Institute in Washington DC. Ayaan was named one of TIME Magazine’s “100 Most Influential People” of 2005, one of the Glamour Heroes of 2005 and Reader’s Digest’s European of the Year for 2005. In 2007, she founded the AHA Foundation to protect and defend the rights of women in the US from harmful traditional practices. The Foundation focuses on violence against women and girls including honor violence, forced marriage, and female genital mutilation. In 2013, Ayaan very proudly became an American citizen!